Personally, I think there are way too many college bowl games. It seems like more and more get added to the schedule every year. They’re beginning to be overproduced like plain one-colored jersey cards. I guess as long as companies keep throwing money at them two teams will find their way to a “big” game. Penn State is scheduled to take on USC on Monday in the 103rd Rose Bowl Game. 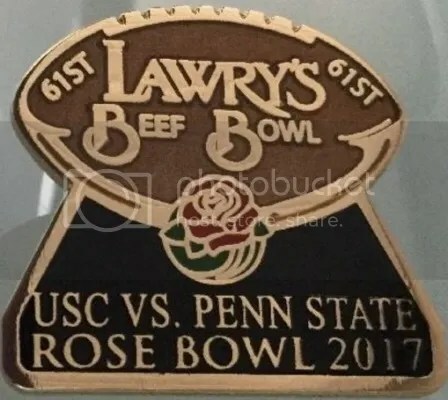 Earlier this week, Penn State beat USC in another classic bowl game – Lawry’s Beef Bowl. Lawry’s is an upscale restaurant in Beverly Hills that has been hosting the Beef Bowl for 61 years. What is the Beef Bowl? Before the Rose Bowl, each team is served a hefty meal of prime rib. Whichever team eats the most, wins the Beef Bowl. Penn State ate 536 lbs. compared to USC who came in at 502 lbs. That’s a combined 1,038 lbs. of beef eaten. Lawry’s Dallas, TX location also holds a Beef Bowl for the two Cotton Bowl participants. You won’t find that much merchandise when it comes to the Beef Bowl. Occasionally pins will show up. 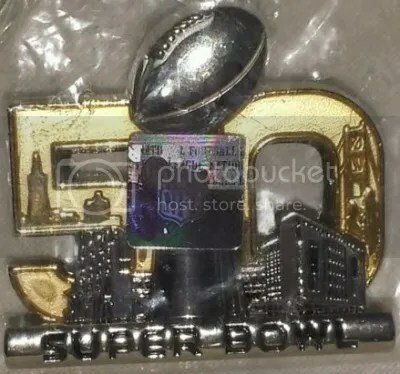 I bought this pin for $12 last night. This specific pin was given out to players, guests, and members of the media who attended the dinner. On January 2, 2016 Penn State will take on Georgia in the TaxSlayer Bowl. The last time Penn State played in this particular bowl game was in 1976 against Notre Dame. At that time it was simply known as the Gator Bowl. The TaxSlayer Bowl is one of the oldest bowl games. Its been around since 1946. Over the years its taken on different names. It started out as the Gator Bowl. From there it went on to be the Mazda Gator Bowl, Outback Gator Bowl, Toyota Gator Bowl, Konica Minolta Gator Bowl, Progressive Gator Bowl, and TaxSlayer.com Gator Bowl. Now its just the TaxSlayer Bowl. They dropped the “Gator Bowl” name off the official title when they renegotiated a new contract in 2014. There isn’t a whole lot of TaxSlayer Bowl merchandise. They have an official store, but most of the items don’t deal with the bowl game itself. What you’ll find are team specific stuff. I did see that they have 2016 TaxSlayer Bowl shirts. I’d like to see more bowl merchandise. This is about as basic of a pin you’ll find. It has no dates and/or teams listed on it. I’m guessing it was made after 2013 though because of the name. They have been selling for $15.00. Anyone remember the Bud Bowl? This was a marketing campaign put on by Anheuser-Busch advertising it’s family of Budweiser beers. The commercials featured Budweiser bottles playing against Bud Light bottles. 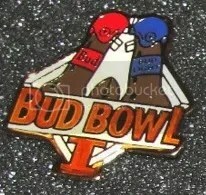 Bud Bowl I took place during Super Bowl XXIII in 1989. This was an annual event to watch for up until 1997. They skipped the normal Bud Bowl game in 1996, and only held a contest. 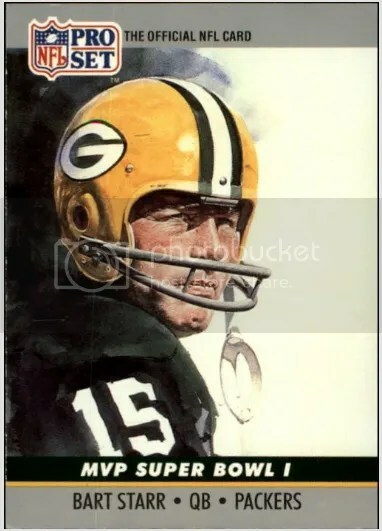 Game pieces with plays on them were probably distributed to fans in cases of beer. The people with the winning play on their piece won. By 1998, the Bud Bowl was removed from T.V. The name was mainly used for in-store displays. Today you don’t see it at all. Bud Bowls were filmed using 3D computer graphics and stop-motion animation. In some cases, it could take many hours to produce a few seconds of footage. 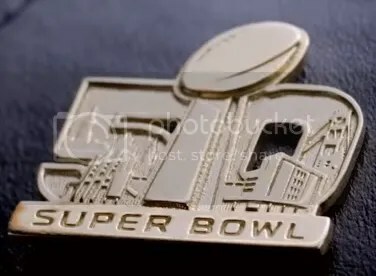 Throughout the years the Bud Bowl had a slew of famous announcers including Terry Bradshaw, Chris Berman, Marv Albert, Howie Long, and Ronnie Lott. Bud Bowl I ended with Budweiser winning 27-24. Budweiser won six of the eight Bud Bowls. Anheuser-Busch slapped the Bud Bowl name on practically everything. They made a few different pin sets. These sets were mass produced and easy to find.